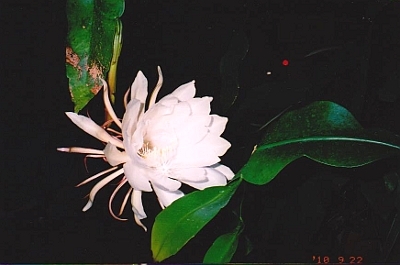 "Gekka-bijin or a "queen of the night" flowered in a pot in the garden. I have been watchful, as it always flowers late at night in bright light of a near-full moon. As expected, it flowered magnificently on the night of the harvest moon. At midnight, when the moon was high in the sky, it fully opened over a very short period of time, just as in a slow motion film. It was open for only about 5 hours at the dead of night. 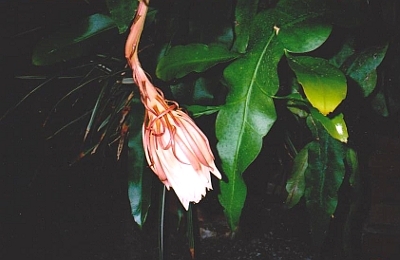 What a magical flower it is! It bears five new buds now. I wonder if they will all blossom responding to the next full moon. It is very interesting to see. Five hours later, it is finished and withered. I attended the OAA Matsue conference. 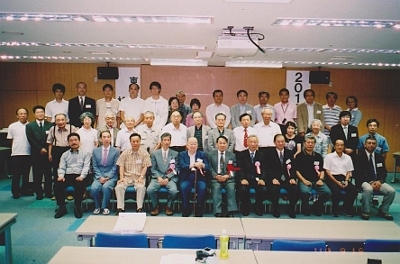 Although the attendance was not large, all the participants were enthusiastic and the conference ended with a great success supported by local OAA members and Matsue Hoshino-kai (Matsue Star Club). The minutes were approved after some discussion. Research papers were presented by five people including Mr. Takehiko Kuroda of Nishiharima Astronomical Observatory followed by questions and answers. There was also an intriguing talk on Izumo and its history by Mr Daisetsu Fujioka. Mr. Masaru Matsumoto, discoverer of the Mihonoseki meteorite, presented an interesting story about the landing of the meteorite and how his discovery had changed his life. The following day in my lecturer I talked about my encounter with comets and how it had changed my life referring to Mr. Matsumoto's life changing experience of his meteor discovery. Strangely, 45 years ago today, September 19, is the day to commemorate the discovery of Comet Ikeya-Seki. Just like today, it was Sunday. The topic of my lecture was "the day I discovered a Kroitz comet". I wore a hand-winding watch I had been wearing at the time of the discovery. It is still working today. The delicate ticking sound of its second hand brought back the fading memory of the powerful emotion of the day of the discovery. At the award ceremony I was surprised at a large number of discoveries by Mr. Koichi Itagaki, 16 in all in one year. 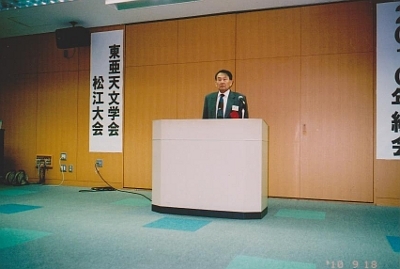 Mr. Masanori Tsuboi received an award for his discovery of two supernovae and Mr. Hideo Nishimura for four novae. Mr. Nishimura told me he had once visited me at home. I presented the OAA Award to the previous OAA president Dr. Ichiro Hasegawa and Issei Yamamoto OAA Academic Award to Mr. Naoya Matsumoto of Kyushu, whom I had met for the first time. Awarding people for their achievements is a wonderful thing. The local OAA members made the conference successful with their great efforts. The magnificent view from the conference venue added to the success of the meeting. It was a memorable, flawlessly managed occasion. After the first day of the conference, we moved to a restaurant on the shore of Lake Shinjiko. The glass-walled restaurant on the first floor was overlooking the expanse of the vast lake and the red evening sun setting on the lake was a magnificent sight. 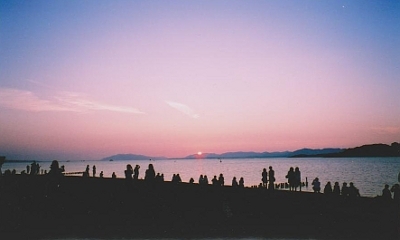 A large number of tourists all lined up on the shore taking in this unusual beautiful sight. Over the rough sea of Tosa, the setting sun appears bulb-shaped, but here an round sun was setting on the placid lake. Five women from Shizuoka prefecture made a special appearance to sing in chorus, which made the get-together all the more enjoyable. The next conference will be held in Tokyo. In my concluding address I expressed my hope for further developing the OAA and making the association attractive especially to young people. On my way home I was in company with Mr. Kuroda, Mr. Matsumoto, Mr and Mrs Funada, and Mr. and Mrs Yabu on the Hakubisen-line train. From the window I saw Mt. Daisen towering stately as if suggesting the bright future for the OAA. In August I visited Mizusawa in Iwate prefecture again. There were commemorative events to celebrate the birth of Minor Planet Hiraizumi. A panel discussion was held with the participation of the prefectural governor. During my stay there, I had an opportunity to see the Donohoe Comet-Medal at the National Astronomical Observatory at Mizusawa (formerly Mizusawa Latitude Observatory). This medal was awarded to Mr. Masamitsu Yamasaki by the Astronomical Society of the Pacific 80 years ago. While he was working at this observatory, he discovered a new comet. The luster of the medal has not diminished at all even after the passing of many decades. 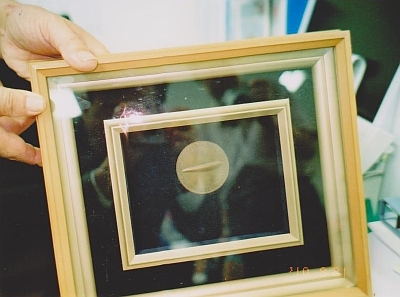 Although the comet was renamed Crommelin, the story of Mr. Yamasaki's achievement will be passed on to future generations as long as his medal continues to shine. This medal was donated to Iwate prefecture by his son Akira. I saw this medal 56 years ago at Mr. Yamasaki's residence at Sagawacho, Kochi prefecture. After more than half a century, I happened to be reunited with this medal at Mizusawa. This Comet Crommelin is a periodic comet with a 28-year orbital period. At its 1956 apparition, I independently recovered it and fulfilled the promise made to Mr. Yamasaki. 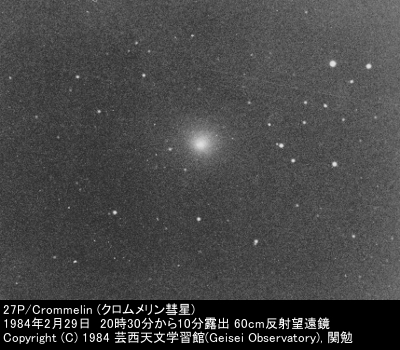 Twenty-eight years later, in 1984, the comet returned and I observed it with Geisei's 60cm reflector. The next apparition of Comet Crommelin will be in 2011 or 2012 and make people talk about Mr. Yamasaki's achievement again. In July I visited Himeji city on the occasion to mark the naming of minor planet "Himeji". By courtesy of Mr. Takehiko Kuroda, director of Nishiharima Astronomical Observatory, I was given a tour of the observatory. The main telescope of the observatory was a 2-meter reflector. As soon as I saw it, the image of Subaru Telescope at Hawaii came to mind. It wasn't a coincidence. This telescope was built by Mitsubishi Electric, the same company that had built Subaru Telescope, and the blue paint used on the 2-meter telescope was the leftover from the paint on Subaru. Several staff members were staring at the computer monitors and seemed to be engaged in the study of distant galaxies. This observatory has a number of different size facilities, among which was a dome housing specially designed fast wide-angle camera. I was stunned when I looked at the telescope in the dome. It was a "Neo-Fax camera" proudly owned by Mr. Koichi Ike of Tosa city 35 long years ago. This is a special purpose Maksutov camera designed by Mr. Yoshio Kobayashi, an expert optician in Kyoto, and ground by Mr. Kibe. Mr. Ike funded the project. The main feature is its fast optics of f/1.4 or f/2.0. Mr. Ike completed this camera pouring large sums of money into the project and installed it on the rooftop of his residence situated in the business quarters of Tosa city. His goal was to discover a comet, but his efforts ceased after several years without a single success. For unknown reasons, a man calling himself "S" came to collect the camera from Gifu prefecture. Since then, the camera's whereabouts hadn't been known for more than 30 years. I heard that they made three of these peculiar cameras. This one at this observatory may not be one of them, but I surely remember a staff member of the observatory called it a "Ike Neo-Fax camera". This Mr. Koichi Ike is now retired to Chiba prefecture. I wonder how he would react when he saw this camera. Mr. Ike revealed his camera project at the Second Comet Conference at Katsurahama in 1973 and proudly lectured on it, but it ended as an unrealized dream of his adventure. In July, I visited Himeji City Science Museum to give a lecture. It was to commemorate the naming of Minor Planet Himeji. On display in the corner of the room was a 22cm reflector. 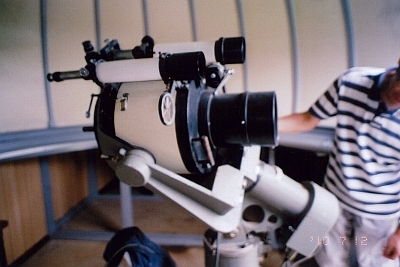 I had been using this telescope at Geisei Observatory since 1973 when the observatory opened. 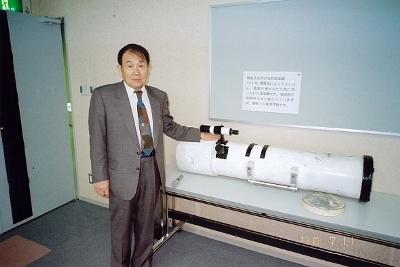 A long time ago, I handed the telescope over to Mr. Takaaki Ozeki who worked at Himeji City Science Museum. Mr. Ozeki was born in Tosa city, Kochi prefecture. The mirror of this telescope is a masterpiece ground by Mr. Kojima. The photograph shows my reunion with the telescope after 35 long years. I recovered a periodic comet using this little reflector; it was my first in recovering periodic comets. I still fondly remember this memorable occasion. This comet was Comet Finley. It was in June 1974 when the observatory was still a shed owned by me privately. 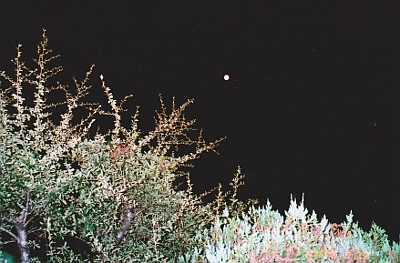 I frequently traveled to the observatory to find this comet, which was near perihelion and moving low on the horizon in the predawn sky. I searched taking advantage of clear skies prior to the start of the rainy season. This 22cm reflector was unusually small for recovering periodic comets. I took several photographs of the area where the comet was predicted to pass using Kodak's glass plates designed for astronomical use. In those days Dr. Elizabeth Roemer in the United States was a dominant figure in comet search, while in Japan the late Mr. Koichiro Tomita was successively discovering faint periodic comets using the 90cm reflector at Dodaira Astronomical Observatory. The appearance of an amateur astronomer on the scene and his unexpected discovery of a periodic comet must have stunned not only Mr. Tomita but Dr. Marsden, director of the Central Bureau for Astronomical Telegrams. Before long, my observing instrument progressed to a 40cm reflector also ground by Mr. Kojima, which enabled me to recover many more periodic comets. I kept in mind that I should make the best of the aperture of the telescope, no matter how small it is. This applied to comet search and I succeeded in discovering three new comets using an 88mm refractor. Comet Ikeya-Seki is one of them. Copyright (C) 2010 Tsutomu Seki.